This large apartment (105 sq.m., 1150 sq.f.) near Palazzo Pitti and Ponte Vecchio is on the second (and top) floor of a two-storey 15th century building once home to the "Forni Reali" (Royal Bakery) where the De Medici had their bread cooked. Completely renovated in 2001, it now offers all modern comforts (see the list of amenities below). The apartment entrance is on a pedestrian-only street, with the three bedrooms facing two quiet inner yards with trees and a water fountain. Palazzo Pitti and Ponte Vecchio are just one minute away, while in 5-10 minutes you can walk to the Duomo and Piazza della Signoria. The large living-dining area has terra cotta floors, 15th century wood beams and a large chestnut Tuscan-style dining table sitting 8 people comfortably. The modern and spacious eat-in kitchen with beech cabinets and a breakfast/bar counter is fully equipped and offers over 5 meters (15 ft) of stone and stainless steel counter space for food preparation. The office area has a large desk, ceiling lights, and all office equipment is available upon request. The large bedroom features a king size bed. The medium bedroom has one elevated bed and two single beds that can be joined together into a queen size bed. The small cozy bedroom has a single size. All bedrooms have hardwood floor, except for the smallest one which has terra-cotta floors. Two additional people can be accomodated in the sofa bed in the living room. The large bathroom has cherry cabinets, hardwood floors and a modern shower stall and water jets for massage. Note that there is no tub in the apartment. The other bathroom is small but has its own shower. Two sky-lights, eight windows and several wall and ceiling lamps provide ample illuminations to every point in the apartment at any hour. All windows have screens. Parking available at a nearby garage (100m away). Air Conditioning (cool and warm), single heating, screened windows, All kitchen utensils, microwave oven, electric oven, semi-professional gas range, good-size fridge with freezer, coffee maker, toaster, Washer (no dryer, but there is plenty of space to hang cloths), stereo, cordless phone, high-speed internet (DSL), shower stall with water jets, all linens provided, cleaning service available, Nearest garage is 1 minute away. NOTE. The following MUST be requested when the reservation is made: parking. We rented the apartment from August 28th to September 25th, 2018. On the positive side: the apartment is bright, sunny, cheery and spacious with nice skylights. It has a modern fully equipped kitchen and a comfortable dining area seating eight. Air-conditioning units worked seamlessly. The TV and internet worked well. The location on the Oltrano side near the Piazza della Passera, a lively and easy to access either from the Ponte Vecchio or the Ponte Santa Trinita. There are three bedrooms: the master bedroom with a king size bed, the second -bedroom with a pair of side by side twins as well as a third elevated loft like bed partially over them, and a third bedroom with a single bed. As there is a clothes-washing machine, but no dryer, it was most practical to set up a collapsible clothes-drying stand in the single bedroom which then eliminated its potential use as a bedroom. Of course, one might set up the dryer in the living room but that might not be particularly pleasant. On the negative side: there was the disgusting stench of sewer gas emanating from the second bathroom when we arrived (which has been previously commented upon by another reviewer). The property manager, resisted our requests to get a plumber and ACTUALLY TRIED TO PERSUADE US TO LIVE WITH THE SMELL. We insisted she get a plumber immediately. Instead she sent over an aide who poured some powders into the toilet which temporarily mitigated the problem. The next day we told the property manager to get a plumber or we would report her to the authorities.She did, the stench were gone and has not reappeared. While the property advertises two bathrooms which is literally true. But, the second bathroom which is completely tiled on three-sides has merely a ceiling suspended shower head which sprays water all over the entire room except for the door which can be protected by a shower curtain which one must pull tight. There are two hooks between the curtain and the door for towels. So, if you don’t mind removing the toilet paper and your stuff from the room before showering or a wet toilet after showering then this is the shower for you. We never used this shower. The principal bathroom is quite nice. But if you are handicapped you may not want to pull yourself up and in to the shower as there is an approximate 19-inch step from the bathroom floor to the floor of the shower. 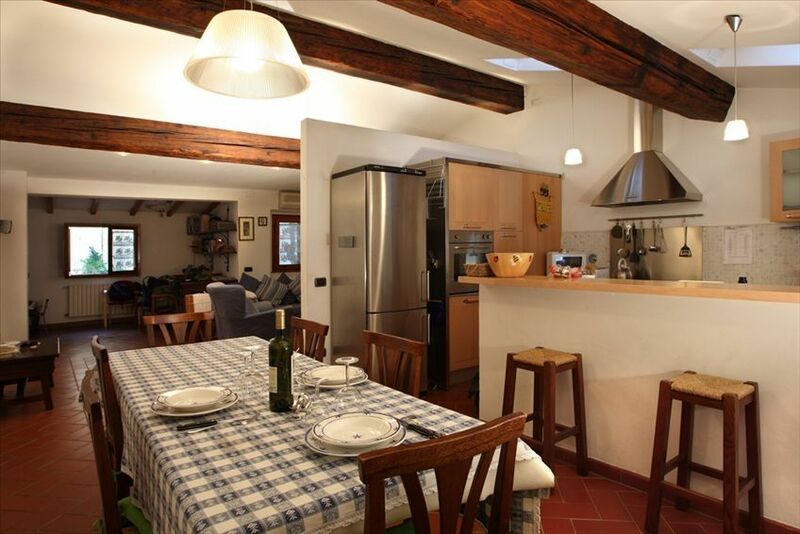 The apartment is located on the Piazza della Passera, just a short walk to the Ponte Vecchio. We felt fortunate to have one of the best gelaterias and restaurants right in the Piazza. Whenever that gelato urge struck, all it took was a quick trip downstairs and viola! The Quattro Leoni restaurant is one of Florence's best if you want to indulge your meat cravings. Order the bistecca alla fiorentina, and be sure to also order zucchini flowers. Our grandchildren said the lasagna was the best they'd ever had. Superb. The apartment is well equipped, and is comfortable for a family of six. One large bathroom was shared and a teeny, tiny bath was used when demand was high. Be sure to bring your own wash cloths and bar soap as these are not widely available other than in hotels. There is a grocery store nearby as well as two coffee shops for breakfast if you want to eat out. The welcoming staff was first rate, as well. One of them, Veronica, is also a certified tour guide and can arrange tours for you while in Tuscany. Be sure to have Whats App installed on your phone to make communicating with the apartment staff free and easy. We simply texted Valeria when we arrived at the airport and she met us at the apartment. For convenience to all the important places in Florence this apartment was perfect! We really enjoyed the flat, were so grateful for good air conditioning, loved the location, near the sights but not so touristy!! My only negative was that it was advertised as having two full bathrooms. Really it was 1 1/2. The shower in the second bathroom would have drenched the whole bathroom, toilet paper, etc. because it was not enclosed. There was no place to protect your towel or clothes while using the shower. Loved the apartment. Lots of natural light and updated appliances. Plenty of room for our family to relax. We were able to walk everywhere with restaurants, grocery and shops near by. Walking distance from the train station; clean and neat; restaurants located within steps of the door. Quick walk to the Pitty Palace which was phenomenal. The apartment is in a great location, with many shops and restaurants near by. Unfortunately, the second bathroom had a horrible odor coming from it so we did not use it at all and it made things a bit tough since there were 7 of us staying there. We had 3 small children with us, so the 2 bedrooms in the back were perfect, but the super small one in the front didn’t really suit us since it was too small for any adults and are children are to young to be in the front of the house all by themself, it would be perfect for a teenager. Overall, the place was very clean and had good, opened shared space so it worked for the 3-4 days we were there, the smell went away after the second day, we unfortunately just had to spend a little of our own vacation time taking care of it.